“The battledrum beats in the space of the mind; aim is taken, and the wound is inflicted. 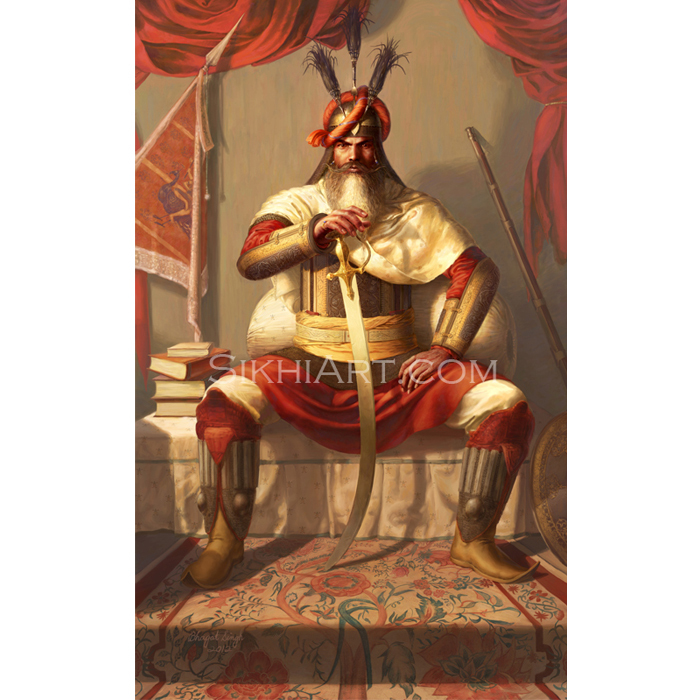 The Battle of Chamkaur was fought between the Khalsa army (little over 40 soldiers) and Mughal and Rajput armies (soldiers estimated in thousands). 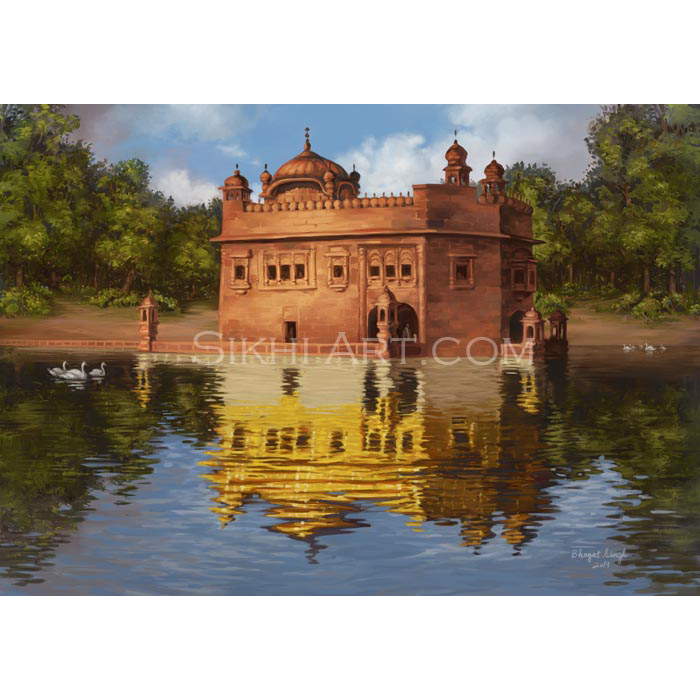 After being tricked in to leaving the fort of Anandpur, Guru Gobind Singh ji found shelter in a haveli, a large fortified house. Despite having assured Guru Gobind Singh ji the saftey of him and his Khalsa, the Mughal and Rajput army were looking for the Guru’s head. They ended up reaching Chamkaur di Garhi, and laid siege. Khalsa archers immeditely took their places, and showered arrows upon the opposing forces through the windows of the fortress. 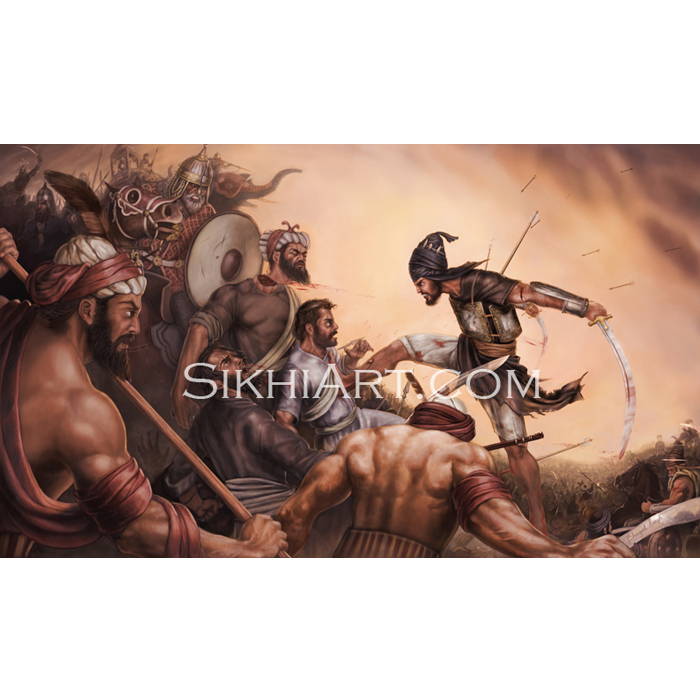 Teams of 5 Khalsa were constantly sent outside to defend the fortress. 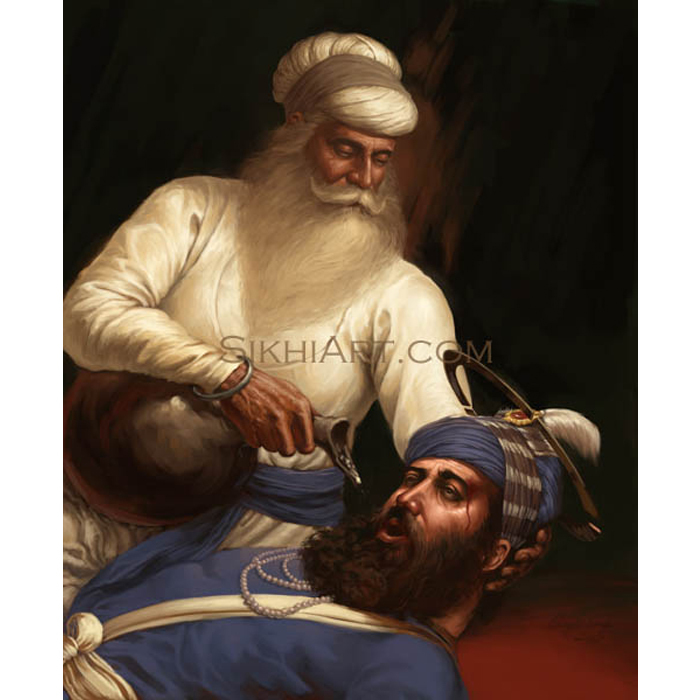 As the day grew old, the Khalsa forces were running out of soldiers. 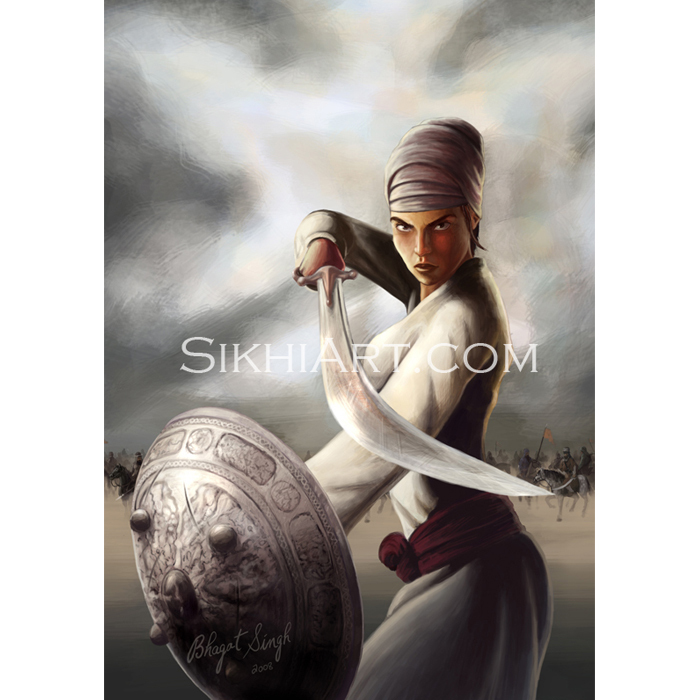 At this point, Guru Gobind Singh’s eldest son, Baba Ajit Singh, at the age of 18, volunteered to join his fellow Khalsa in battle. 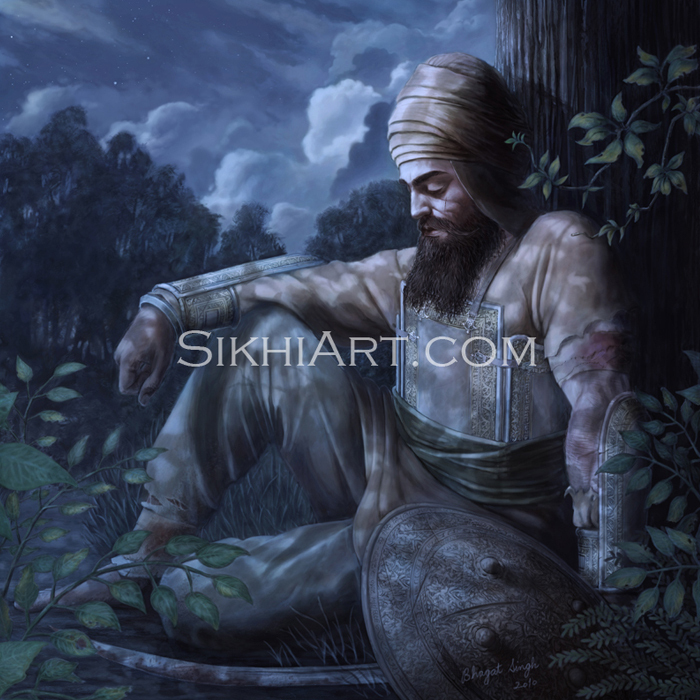 Guru Gobind Singh ji knew this would be his son’s last battle, instead of letting his emotions stop him from letting his son dive into a death hole, he felt proud of having such a brave son! 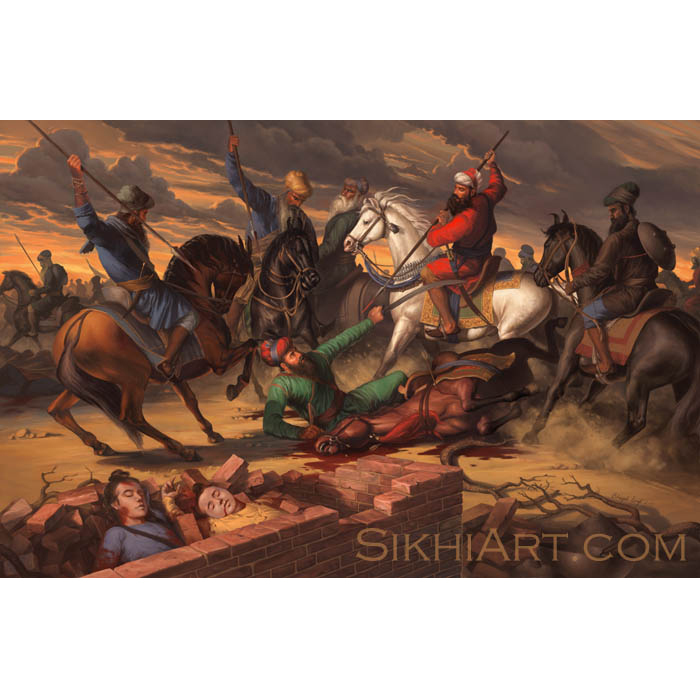 Battle of Chamkaur was simply a fun painting to work on from start to finish. The nature of the painting required an intense amount of planning and referencing. Everything in this painting is based on a reference, down to the last detail, even the soldiers in the background. 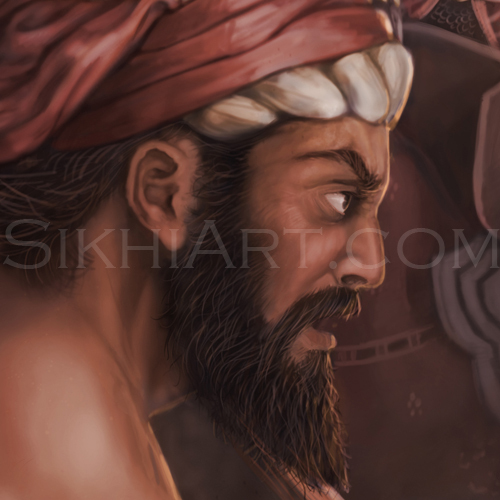 As I worked on, I thought about how Sahibzada Ajit Singh might have ended up as he is shown in my painting. 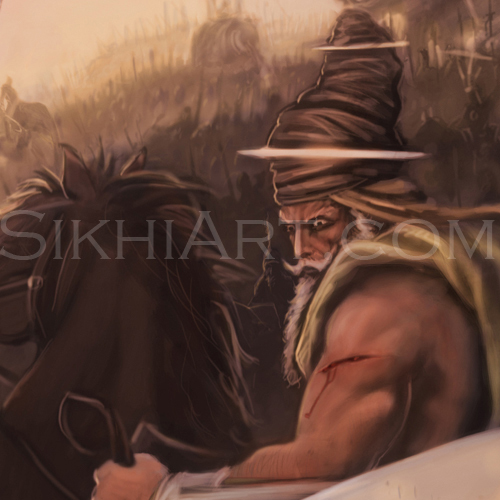 Sahibzada Ajit Singh charges into battle with his spear in one hand and shield in the other. 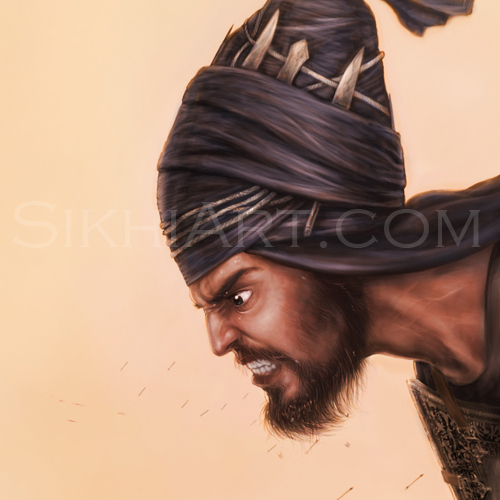 He runs his spear through the hearts of many Mughals. Before its, now blunted, end is proven to be useless, he hurls it towards the approaching cavalry, and pulls out one of his curved shamshirs. The charge has left his horse with many wounds, it has been blinded by the enemy archers. It topples over, throwing the Prince towards the ground in front of him. On the ground, the Prince is greeted with deadly strikes. Keeping his balance, he moves quickly – dodging, and blocking most of them with his hardened, rhinohide shield. Just then the injured Prince notices a Mughal cannon being readied for the seige. 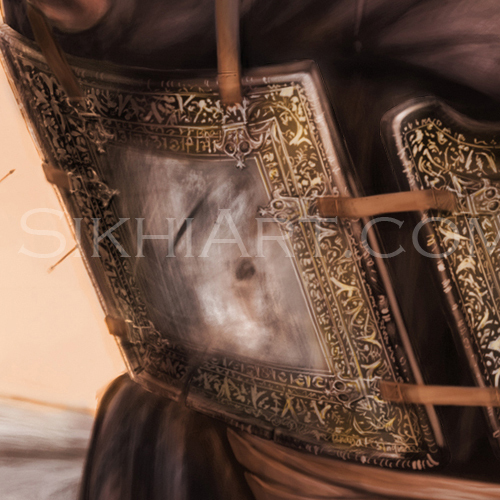 He discards his shield – who knows what it hit, who cares… He pulls out his other sword; it was dying of thirst. 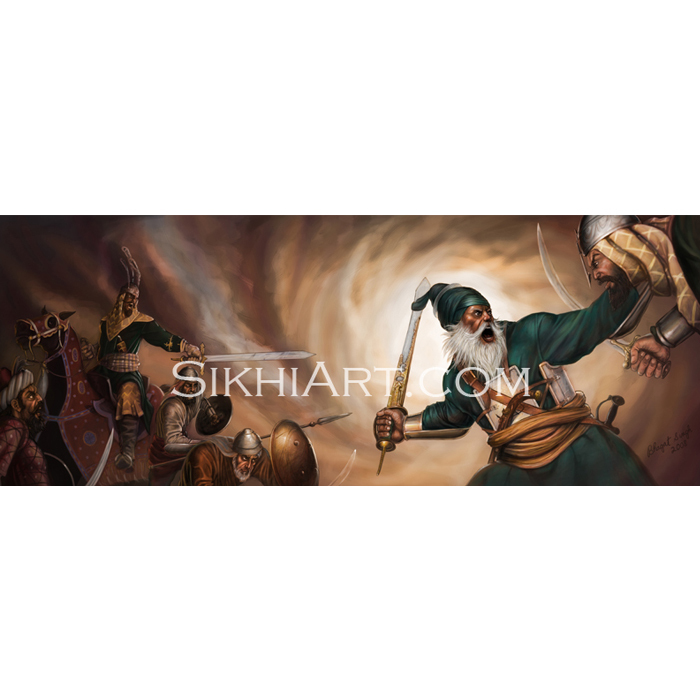 With blood raging through his mortal body, the immortal Ajit Singh then charges the infantry that guard the cannon! Some high ranking Bhumi militiamen and Cavalrymen see his strategy and rush to defend it! I thought Ajit Singh ji was simply awesome. At the age of 19, I was the same age when I started working on him, he… one second – we get stage fright when facing a few people, I remember all the knots and goosebumps I got from talking in front of class, even greater still, singing kirtan on stage – Ajit Singh ji charged his horse towards oncoming army in their thousands! 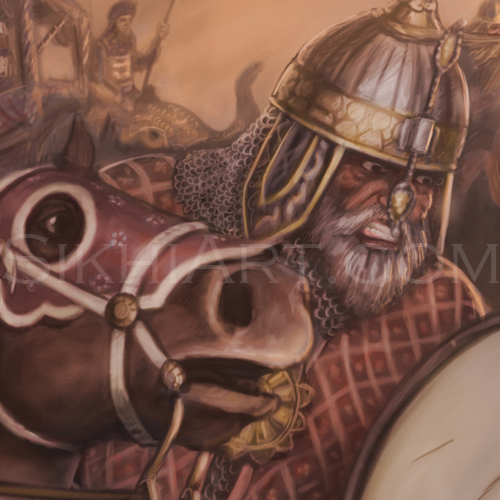 The direction of their weapons and aim were not a coincidence, Sahibzada knew very well that this was the ultimate “stage fright” and that he would not survive this battle. Yet he fearlessly charged straight through the heart of the army. He sacrificed himself for what he believed in. Sahibzada Ajit Singh ji is just a great example for anyone, to be fearless and more importantly to meditate. I feel that the power of meditation in creating fearless warriors, poets and revolutionaries is unbeatable. I have to note that their Dumallas would probably not be look like this. I painted a modern Dumalla because it looked cool and thought that’s what they wore. 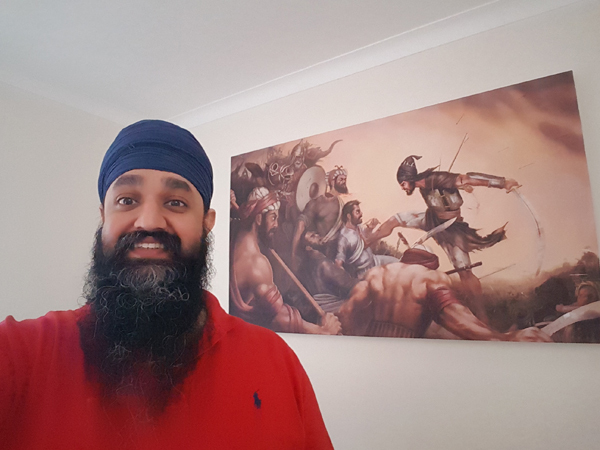 I take historical accuracy very seriously but when I painted Sahibzada Ajit Singh ji, this was the height of my knowledge. Now I have grown taller. In my newer paintings I have tried my best to depict accurate dumallas. It’s truly an epic painting…so much happening in the picture it’s so intense. Your art work is amazing. Keep up the amazing work totally captivating. This painting has been up on my wall for a couple of weeks now and I still can’t stop grinning when I look at it..
It’s so captivating every day I pick up a piece of detail that I’ve not noticed before. The artist has taken this painting to an amazing level of detail. A beautiful piece of work by a truly talented artist. Very happy with it. 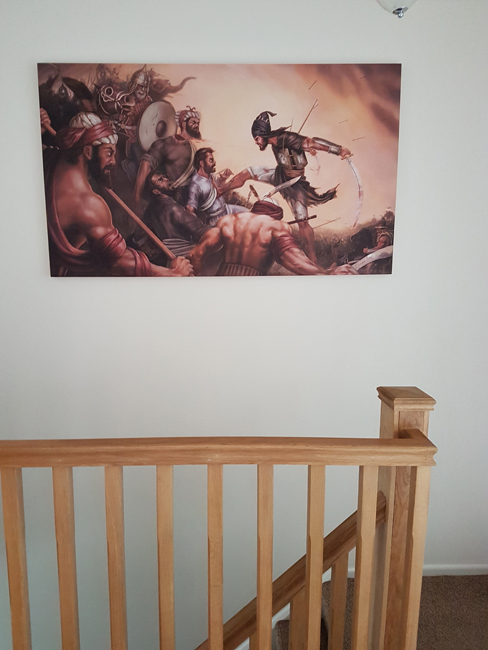 Looking at every morning gets me motivated for the day ahead and if I do have any problems or struggles it gives me strength to deal with them. Thank-you for painting such a wonderful scene. Keep up the good work! 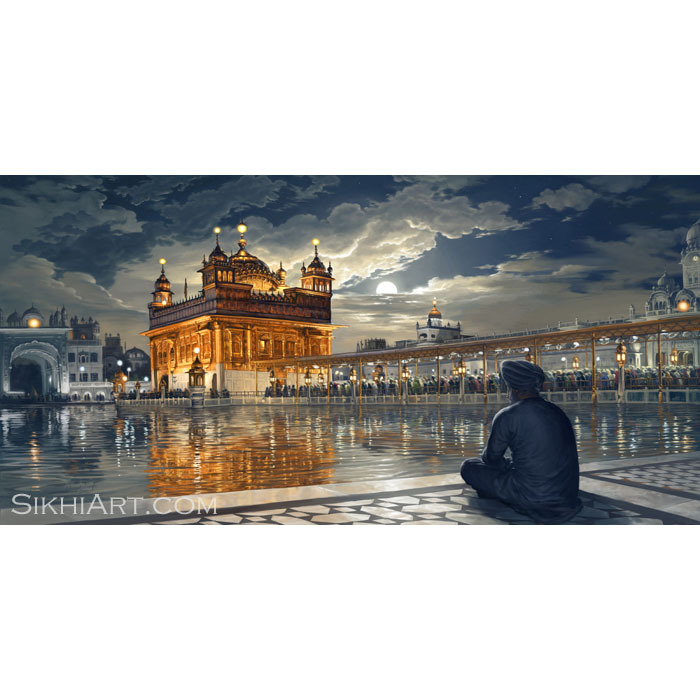 It is a very nice painting and the emphasis on Baba Ajeet Singh is sublime.